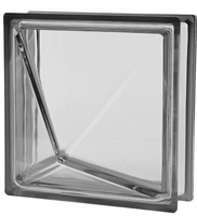 With its asymmetrical pyramid shape evoking illustrious historical precedents - such as the facades of Palazzo dei Diamanti of Ferrara or Palazzo Strozzi of Florence – the Diamante glass block is a unique tool with which to establish artistic and sensory dialogues. Designed to offer the world of contemporary architecture new design possibilities, styles and effects— Diamante features a prominent three-dimensional diamond-shaped glass design on the external surface of the glass block. The unique symbol was chosen in collaboration with 5+1AA, to represent the recurring themes in contemporary architecture: the interaction with the natural light, the nocturnal metamorphosis, the relationship between the interior and exterior, and the quest for beauty as a form of dialogue and wonder. The resulting effect is not only dynamic but geometric: glass surfaces with multiple textures, linear shapes and illusions of perception. Due to its complex glass design, Diamante is produced using a semi-handmade process that requires high-quality technology and careful attention in the molding of the 3D design. The same unique production technique, in fact, that was previously developed by Seves Glassblock to create the Doric glass block -the first to feature an external three-dimensional glass design in relief- for internationally acclaimed architect Rafael Moneo. Diamante is only available in the clear version, with transparent finishing.